The German player won the million dollar prize after coming from behind to beat ‘Dzeferin0’ heads-up with ‘Dzeferin0’ banking $100,000, along with ‘woroms444’ who finished in third place. A few minutes after his win, ‘Check^On123 said: “I'm a little shaky. Excited, but nervous." $1 million Spin & Go tournaments are running as part of the PokerStars Makes Millionaires promotion, which began in April and runs until June. Spin & Go tournaments are fast-paced, 3-max Hyper Turbo tournaments that start with 500 chip stacks. Each tournament has a randomly drawn prize pool that awards between two and 10,000 times your buy-in. 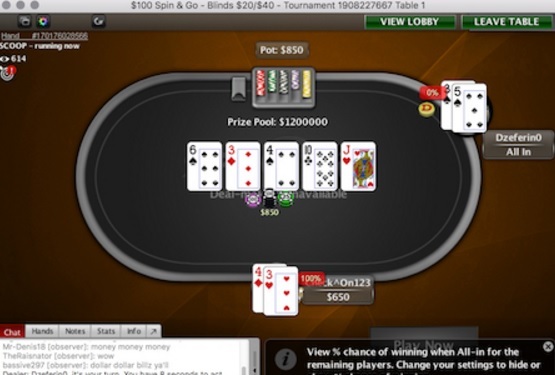 PokerStars offer Spin & Go tournaments at a variety of buy-in levels between $0.25 and $100.